PTC thermistors act as thermal protectors for electrical motors. They are available with or without an insulated sleeve and have flexible connecting leads. PTC thermistors have a non-linear resistance/temperature response. 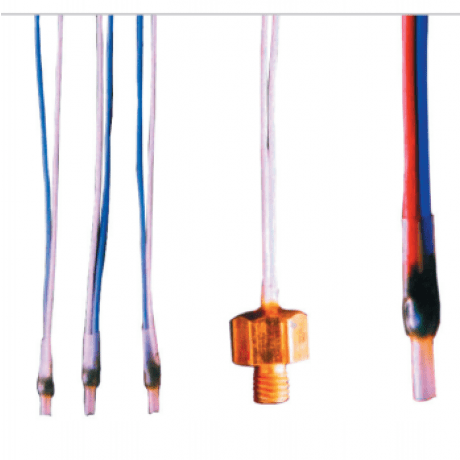 At a specified temperature the resistance changes rapidly to a very high value. When ordering please specify thread size, otherwise the stock M4 size will be supplied. in this range, NTC thermistors are easier to measure and more accurate. PTC thermistors are especially suited as temperature sensors for monitoring the windings of electric machines, and also for use in simple fail-safe circuitry. When a given temperature (nominal response temperature qNAT) is exceeded, the circuit can be switched off through a relay or amplifier, since the PTC-sensor will have an extremely high ohmic value in the region of its response temperature. This will have the same effect as a break in the circuit or a failure of the thermistor. – WARNING! It is very important that the sensor must be installed parallel with the copper of the winding, so that the teflon leads can assume the form of the rest of the winding and thereby retain the highvoltage resistance rating. * One PTC might reach ϑNAT + 15 °C, while the second or even both of the others could still remain at room temperature. The PTC’s resistance values for motor protection are specified in DIN 44081/44082. Resistance values below ϑNAT –20 are not specified, and resistance when cold is no indication of the PTC’s condition. It is ideally between 40 – 200 ohms but can be anywhere between 35 – 250 ohms. The greatest resistance change occurs between +/-5 °C either side of ϑNAT, being at least 15%/K. Random testing is carried out according to DGQ P90/P10 (DIN 40080). AQL values can be fixed by arrangement. Quantity Type Temp. Code No. Resistance max.